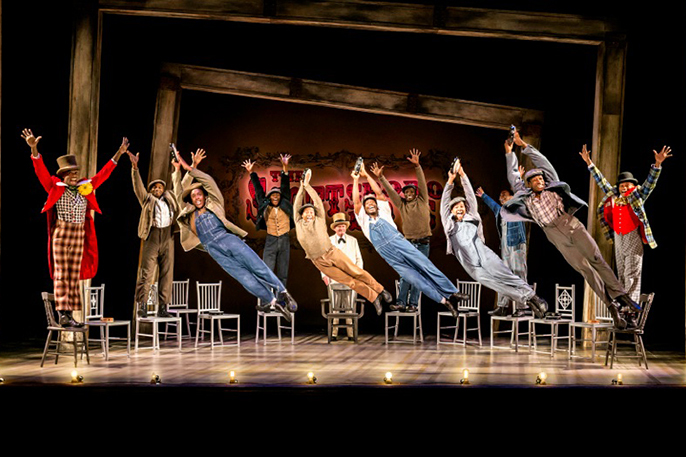 Following its sell out, award-winning season at The Young Vic, The Scottsboro Boys is now taking the West End by storm! The critics are unanimous, The Scottsboro Boys is THE West End musical to see this season. From the legendary creators of Cabaret and Chicago, this 'radical musical' (The Guardian) brings to life the extraordinary true story of nine teenagers, in a case that changed history forever. Winner of the Critics' Circle Best Musical Award 2013 and nominated for 6 Olivier Awards, including Best New Musical, The Scottsboro Boys features 'electrifying' (The Guardian) choreography and direction by five-time Tony Award-winner Susan Stroman (The Producers). A 'show of dazzling sophistication', The Scottsboro Boys is 'irresistibly entertaining' (The Times), and 'finger-snapping, toe-tapping, tremendous' (Financial Times). Don't miss this 'unmissable' (Mail on Sunday, The Times), all-singing, all-dancing, exhilarating and bold new musical, and experience the show that everyone is talking about.